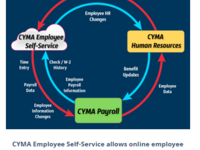 CYMA is ideal for either running in house Payroll or forming the basis for a Payroll Service / PEO business. In House: Process payroll in-house and receive EFT direct deposit, payroll checks, timely tax table updates (W2, 940, 941, etc. 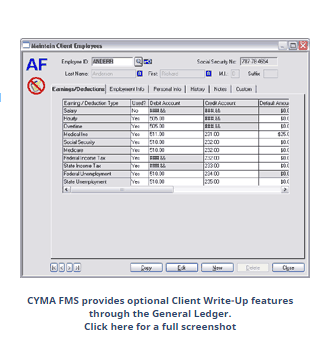 ), payroll reports, calculate employee earnings, deductions, 401k, cafeteria & more. 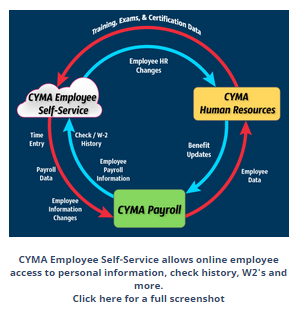 CYMA Payroll also powers PEO & Payroll Services: unlimited employees & companies. Options include advanced Client Billing, Employee Self-Service & state quarterly forms.